I had a really hard time deciding what to load these potatoes up with because there were just so many options. 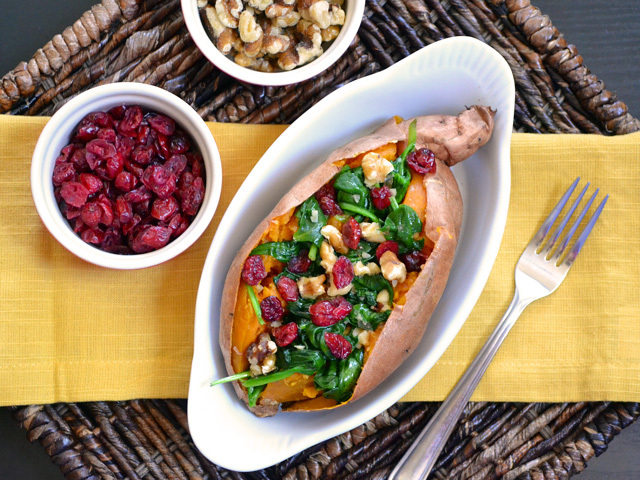 So, look forward to more versions of stuffed sweet potatoes in the future! 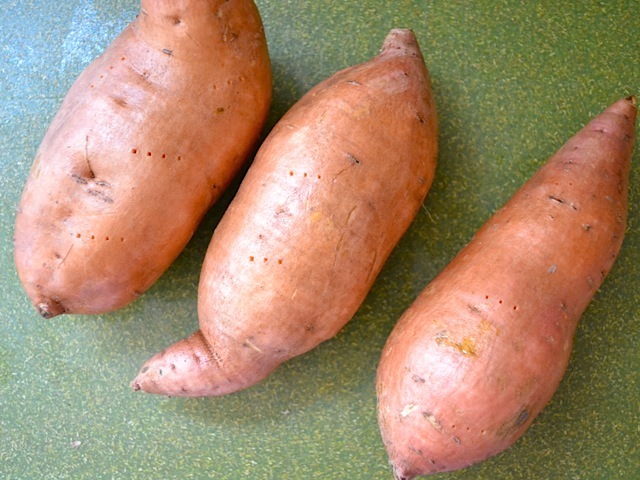 Sweet potatoes are one of my favorite produce items because they’re yummy, nutritious, don’t go bad quickly, relatively inexpensive, and can be cooked about a trazillion different ways. This time I paired them with some sauteed spinach, sweet-tart cranberries, and crunchy walnuts. It’s so simple, yet oh so good! This recipe is vegetarian, but can easily be made vegan by substituting the butter with coconut oil. Sweet potatoes and coconut oil (and coconut milk) go really, really well together. I made three because I knew that’s about how much I’d eat over the next couple of days, but this recipe could easily be scaled up or down to make any number. You don’t really need to measure the ingredients, just wing it. Oh yeah, one more thing… these are pretty big, so I’d consider this the main dish. Maybe add a warm roll, a small salad, or a cup of soup and call it a day. It’s practically a meal on its own! 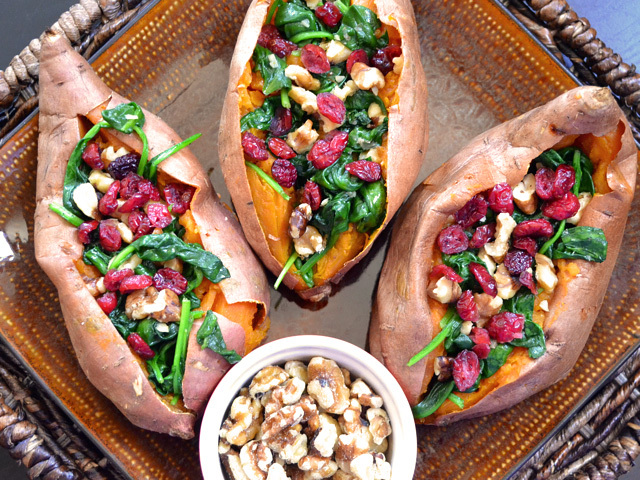 These loaded sweet potatoes are stuffed with garlic sautéed spinach, walnuts, and sweet cranberries. Preheat the oven to 400 degrees. Wash and dry the sweet potatoes. Prick the skin a few times on all sides with a fork. Use one tablespoon of the vegetable oil to lightly coat the skins. 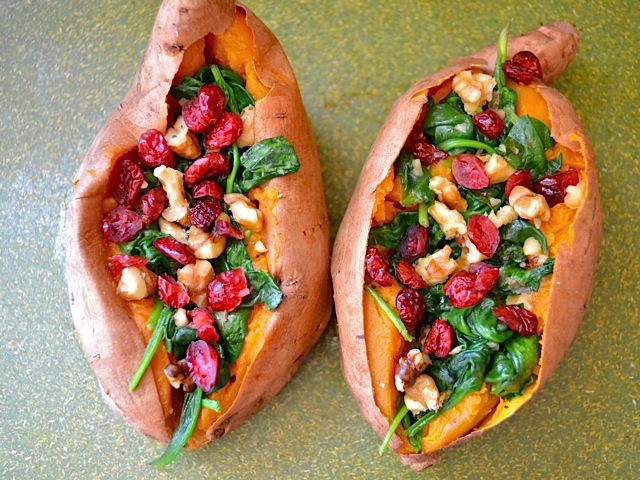 Bake the sweet potatoes for one hour in the preheated oven, or until soft all the way through. You can place the sweet potatoes directly on the oven rack, but place something on the rack below to catch any drippings, as they will ooze slightly while baking. 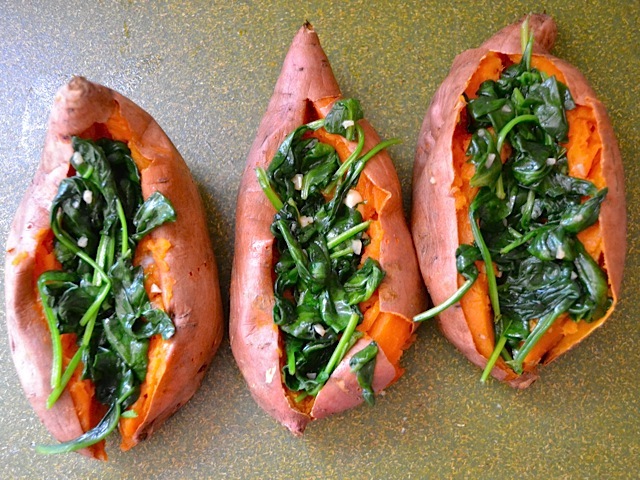 When the sweet potatoes have about 15 minutes left to go, saute the spinach. Add the second tablespoon of vegetable oil and the minced garlic to a medium skillet. Saute over medium heat for 1-2 minutes, or just until the garlic becomes fragrant and slightly soft. Add the spinach (three large handfulls, or about 3 cups packed) to the skillet. Season lightly with salt and pepper. 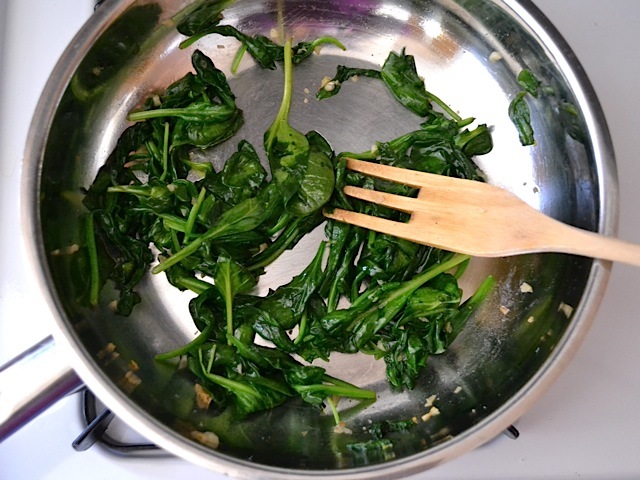 Continue to saute until the spinach is wilted (2-3 minutes). When the potatoes come out of the oven, carefully slice them open from end to end. Use a fork to lightly mash the insides. Add about a 1/2 tablespoon of butter or coconut oil to the inside of each potato and then season lightly with salt and pepper. Divide the spinach between the three potatoes. 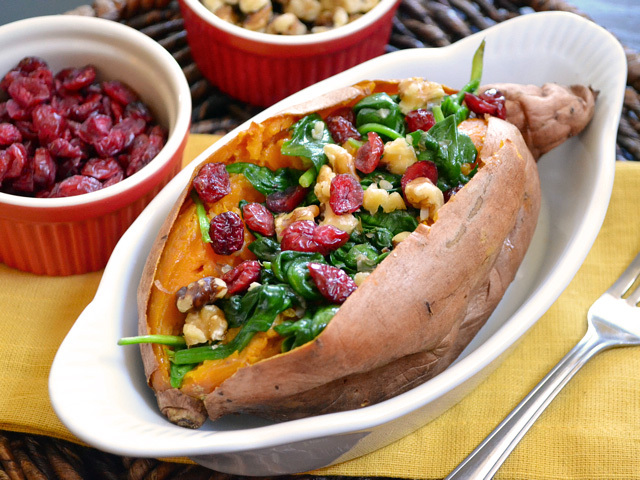 Top with one tablespoon of dried cranberries and chopped walnuts per potato. Serve hot! Preheat the oven to 400 degrees. 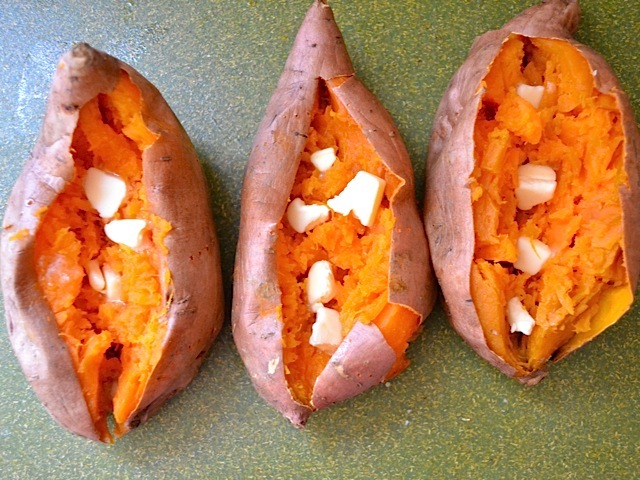 Wash and dry the sweet potatoes and then prick them all over with a fork. 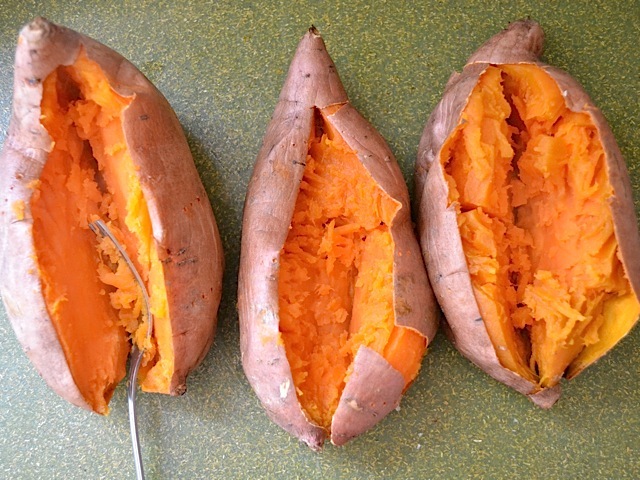 Use about 1 tablespoon of vegetable oil to coat the skins of the sweet potato. Bake for one hour in the preheated oven, or until they’re soft all the way through. I learned the hard way that the sweet potatoes will ooze a sugary juice that burns easily on the bottom of your oven… so, if you don’t want your kitchen to fill up with smoke, put something under them! While the potatoes are finishing baking, begin to saute the spinach. 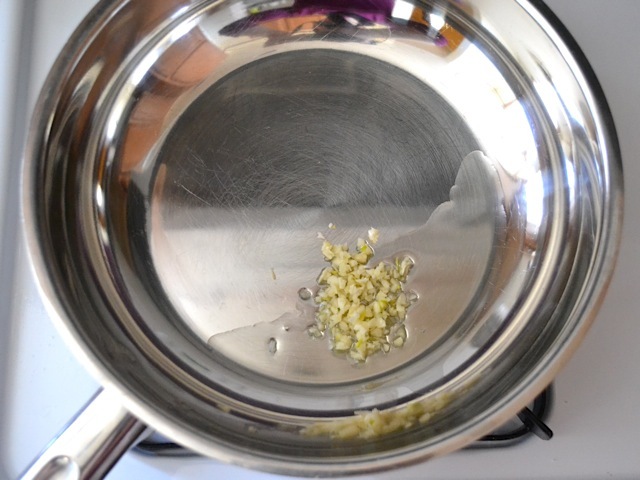 Mince the garlic and add it to a skillet with the remaining one tablespoon of vegetable oil. Saute over medium heat for 1-2 minutes. Add the fresh spinach and a light sprinkle of salt and pepper. Continue to saute until the spinach is wilted. When fresh, this spinach filled the skillet half way up to the top. I used three large handfuls, or about 3 cups packed. When the potatoes are finished cooking, carefully slice them from end to end. Use a fork to open them up and slightly mash the insides. They’ll be steaming hot, so be careful. Add about a half tablespoon of butter or coconut oil to each potato. Season them lightly with salt and pepper. Pile the spinach inside each one. Serve with extra toppings if you’d like. I couldn’t wait, I totally killed that sweet potato. Another winner! The only change I made was using pecans instead of walnuts. What is the nutrition on this recipe? This recipe was absolutely wonderful! It was balanced and filling. The only bit I changed was instead of spinach, I added Swiss chard as my leafy green because the store didn’t have any fresh spinach on hand. 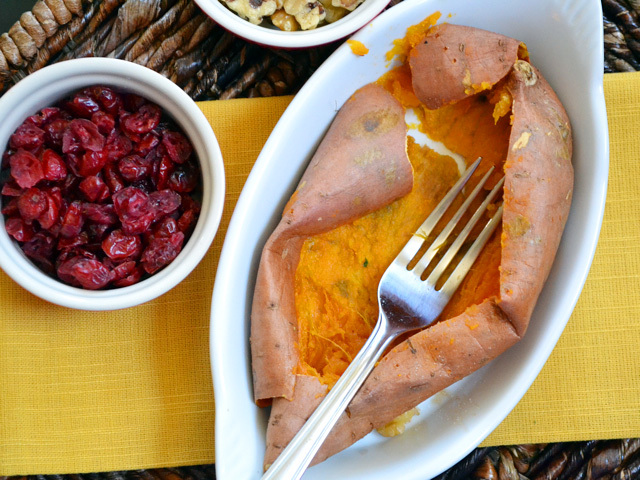 It added something nice to offset the sweetness of the sweet potato and cranberries. Definitely going to make this again! First time making this and it was sooooo good! I added 1/3 of a shredded precooked chicken breast I had from meal prep for additional protein. It was so filling that we split one. I recommend Budget Bytes to everyone I know, whether they are on a budget or not, because I’ve never had a bad recipe from your website! The total recipe is supposed to cost 5.04? I paid almost 15 dollars and had some of the items already. How are you calculating costs? Here is a tutorial on how I calculate recipes costs.